George C. Marshall was a general of such ability and vision he had to be kept close to home. On November 11, 1943, under cover of darkness, President Franklin D. Roosevelt and his key aides sailed down the Potomac River to the new battleship USS Iowa, there to meet with three of the four American members of the Combined Chiefs of Staff—Admiral Ernest J. 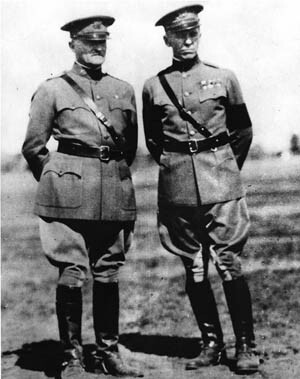 King, General George C. Marshall, and General Henry H. Arnold. Their mission: Sail to North Africa to meet with Allied leaders. A week before Thanksgiving, the American war leaders arrived at Algeria’s port city of Oran. Their final destination was Cairo, where the president’s party would join with Prime Minister Winston S. Churchill and Generalissimo Chiang Kai-shek for a top-secret conference to plan what they hoped would be the victorious stages of the war. At the top of the list was the question of an invasion of Europe. By November 1943 the war was weighted more heavily on the side of the Allies and discussions revolved around a cross-Channel invasion, although Churchill had long been skeptical. Eventually the prime minister acquiesced under pressure from the Americans, who argued the necessity of a full-frontal assault on European soil. It was finally agreed that “Overlord” would take place in May 1944, but command of the invasion was still up in the air as Roosevelt, Churchill, and Stalin huddled with their staff officers, translators, and senior advisers in Teheran, to which the Anglo-Americans had journeyed to meet the Russians. Stalin attempted to force a decision. Upon learning that the commander had not yet been picked, he huffed and puffed and intimated that if his Allies could not decide on who was to command Operation Overlord, then how could they possibly consider launching a second European front in France? All President Roosevelt needed to do, in tapping Marshall to command of Overlord, was issue the order. Stalin’s agreement would quickly follow, for he strongly supported Overlord. If FDR wanted it to happen, it would—but it hadn’t yet. Clues as to why had surfaced in the weeks before the Teheran conference was set to open. 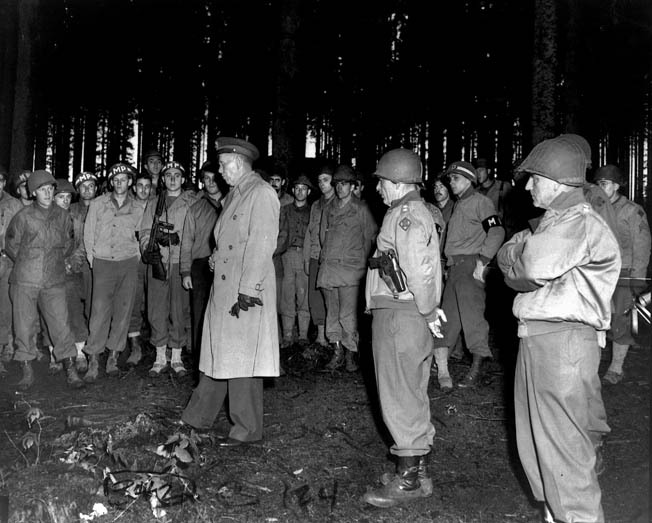 General George C. Marshall visits American soldiers in Europe in October 1944. These troops are destined to fight the Nazis along the German frontier at the fortified Siegfried Line. A very strong case could be made for General Marshall’s indispensability at virtually any point in the war. By the summer of 1943 he was into his fifth year as chief, having been sworn in a matter of hours after German panzer forces stormed across the Polish border just before dawn on September 1, 1939. Fifty-eight years of age at the time, Marshall was the only four-star general on active duty in the Army. Bear in mind that although Marshall inherited an army on the cusp of war it was, nevertheless, a peacetime army led by an officer corps debilitated by “promotion by seniority.” It was not unusual to find captains in their late thirties and early forties, their promotions held in check by the passage of time. The promotion list for brigadier general, as an example, contained the names of 698 full colonels stack-ranked for promotion; in other words, if an opening came up, the colonel at the top of the list would be in line for the star. One of Marshall’s earliest challenges was to replace the antiquated promotion system with one that allowed younger men of merit to rise beyond their mediocre counterparts and seniors. Colonel George S. Patton sat at 525 on that 1939 promotion list. Under the existing policy at that time, 524 colonels more senior to him would have to be promoted, quit, or die before he could be considered for a brigadier general’s star. 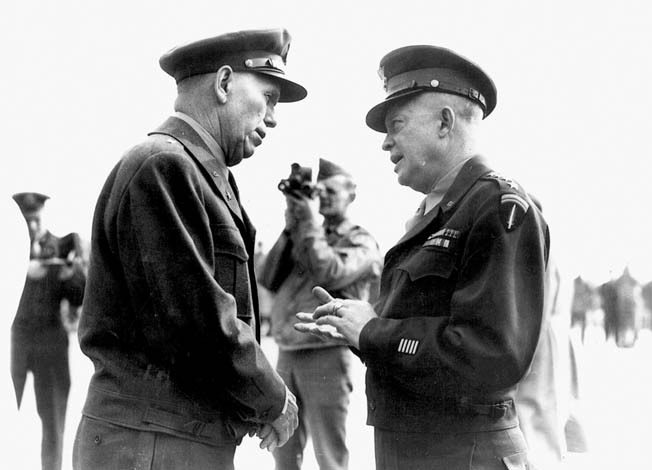 For more than four decades George Marshall’s only life was the U.S. Army. Commissioned in February 1902 from the Virginia Military Institute, he served with the infantry at home and abroad for more than 37 years before becoming chief of staff. From the very beginning of his career, officers crossed his path with whom he was impressed—and Marshall was not easily impressed—or more likely with whom he was unimpressed. Whether at either end of the scale, Marshall made a notation in his “little black book.” Some officers believed it was more in their favor to have made a neutral impression and therefore not appear in the book, rather than risk the 50-50 odds of being notated negatively. Suffice to say that Marshall had a pachyderm’s memory that, bolstered by entries in his book, enabled him to reach down and pick people for high command and great responsibilities, often at very junior levels, with unerring accuracy and astounding success. American Expeditionary Force in Europe. Self-contained was certainly a more accurate description than introverted because Marshall didn’t have a problem expressing himself publicly. He simply was an intensely private person. Not long after America’s entry into World War I, Captain Marshall was sent to Europe with the 1st Division, commanded by Maj. Gen. William L. Sibert. One of the first officers to arrive in France, Marshall took on an exceptional load of responsibility, including acting chief of staff of the division. Training was severely hampered by foul weather and the piecemeal arrival of troops and headquarters staff, including General Sibert, but Marshall nevertheless gave it top priority. Early in September 1918 Sibert was severely criticized for a somewhat lackluster review of his division although circumstances were well beyond his control; he hadn’t been in France long enough to personally impact the training of his division. Later, on October 3, Sibert witnessed for the first time the demonstration of a new technique for attacking entrenched troops and when asked by General Pershing for a critique, he faltered. Pershing was furious and berated Sibert in front of his men for his lack of preparation. Reacting instinctively to the injustice of Pershing’s remarks, Marshall stepped forward and began speaking, but Pershing was in no mood to listen and began walking away. No one, not even Marshall, remembered exactly what was said but Pershing listened without interruption. When Marshall had finished, Pershing said, “You must appreciate the troubles we have,” and turned to walk away. Everyone who witnessed that brief incident, including Marshall himself, believed it was the death knell to a young officer’s career. Quite the contrary, it set the stage for a relationship that endured for nearly 30 years, up to the day Pershing died, at the age of 88 in July 1948. In subsequent visits Pershing always took Marshall aside to ask his opinion, knowing his response would be unfettered. After the war, reverting to the rank of captain, Marshall served as Pershing’s aide. Their relationship was greater than general and aide; it was more like father and son. The general was best man at Marshall’s second wedding in Baltimore and they kept in touch no matter where the Army sent Marshall for duty. It was no accident that under General Marshall, once he engineered the unshackling of the promotion system’s time-honored reliance on seniority, much younger officers began rising rapidly in rank virtually overnight. Many of those first promotions went to officers in whom Marshall had absolute trust and faith, officers who would form the foundation for the war’s leadership pyramid. Again, it was no accident that a great number of those early promotions went to “Marshall’s Men” from his Fort Benning days. In the autumn of 1927 Marshall had been rescued from an interminable assignment at the War College and made assistant commandant of the Infantry School at Fort Benning. It came at a time when Marshall was recovering from the untimely death of his wife, Lily, that August and a desk job for which “I thought I would explode.” A teaching job, together with the responsibility and authority to make substantive changes in the way the Army taught its best officers was, in Marshall’s words, “magical.” Moreover, Benning provided the stage upon which the officers who would comprise the Army high command of World War II performed and learned from a master teacher, whether as members of the staff, instructors, or students. Although he wasn’t an alumnus of Benning, one individual in particular stood out as a sterling example of Marshall’s uncanny ability to take the measure of a man and visualize his potential: Dwight D. Eisenhower. Marshall had met Eisenhower only twice before he brought him to Washington early in the war. The first time was in 1930 when, as a major, Ike was assigned to the Battle Monuments Commission. The 40-year-old officer made a distinctly favorable impression on Marshall and, thanks to an entry in the “little black book,” Marshall’s memory was refreshed when they met briefly a second time 11 years later. By then a lieutenant colonel, Eisenhower was chief of staff of Lt. Gen. Walter Krueger’s Third Army. Marshall was invited to witness maneuvers in the spring of 1941 as Third Army was pitted against Second Army. Eisenhower’s performance caught his attention. Brought to Washington by Marshall, Eisenhower jumped from lieutenant colonel to brigadier general on September 9, 1941. From there he enjoyed the most meteoric rise in rank of any general in World War II. By November 1943 he was a four-star general and Supreme Allied Commander in Europe, living at the time in a villa near the ruins of Carthage. Marshall, right, visits with General Dwight D. Eisenhower in Paris following the liberation of the City of Light from Nazi occupation in August 1944. Having arrived at Mers-el-Kebir, near Oran, early on the morning of November 21, the president’s entourage continued on by plane to Tunis, where General Eisenhower met them. Ike turned the villa over to the president and invited King and Marshall to stay at his small cottage at La Mersa. That evening Eisenhower had dinner with FDR, then the following morning accompanied him on a tour of the nearby ruins. The president quickly got around to the subject of Overlord: “Ike, you and I know who was chief of staff during the last years of the Civil War but practically no one else knows, although the names of the field generals—Grant, of course, and Lee, and Jackson, Sherman, Sheridan and the others—every schoolboy knows them,” Roosevelt said as they walked slowly. “I hate to think that 50 years from now practically nobody will know who George Marshall was. That is one of the reasons why I want George to have the big command—he is entitled to establish his place in history as a great general.” Eisenhower nodded but said nothing, his face masking any emotion he felt at that moment. Marshall returned to Washington and continued as chief of staff. Who cannot but say that Marshall did not serve his country well then. Or thereafter. There was much more to come. Tags Africa, Algeria, Allies, American, American Expeditionary Force, battleship, British, Cairo, Carthage, Chiang Kai-shek, CIA, civil war, EAM, Europe, FDR, Fort Benning, France, general, General Omar Bradley, German, GRU, Igor I, John J Pershing, Meal, Mediterranean, military, modern war, navy, Nazi, north africa, NSA, Operation Overlord, OSS, Overlord, Pacific, Panzer, Paris, Philippines, Prussia, Russia, siegfried Line, St George, Stalin, Teheran, Tern, the civil war, The Division, The Pacific, Thor, Tory, Tunis, US Army, virginia military institute, Walter Krueger, WIN, World War I, years of the civil war.